ROGERS PARK — The month of March was bloody for Rogers Park. Coming off of a three-month streak of no shootings, nearly every weekend in March saw at least one person shot. Yet, as the weather warms, the neighborhood's top cop says he's ready to set the tone for the rest of the summer. The first 70-degree weekend, he said, would be the most important to stem violent crime. 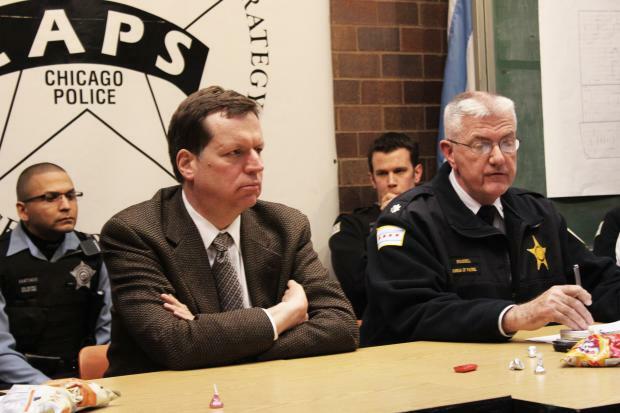 "We had a good three-month-plus stretch," said Rogers Park police district Cmdr. James Roussell. Roussell compared the months between April and October to the "baseball season" of neighborhood crime, and his officers are getting "ready for the 2013 champion season." In March, violence escalated after a 21-year-old woman was shot in the neck March 3 at Rosemont and Claremont avenues, the first shooting in the district since November, police said. The 24th district, which includes Rogers Park and West Ridge, saw no shootings or homicides for months before March, when several people were shot. 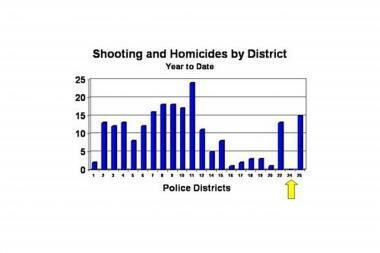 Until then, Rogers Park was the only district in the city with zero shootings and homicides in 2013, leading Ald. Joe Moore to praise "the partnership forged between Rogers Park residents and 24th District police officers." CeaseFire Rogers Park also celebrated at the end of February, hosting a night of poetry and dance at the Mayne Stage. Then on March 10, a man was shot in the elbow in the early morning hours near the intersection of Howard Street and Marshfield Avenue at 4:16 a.m., police said. Roussell said the victims were going to a party when a Nissan Xterra pulled up and opened fire. The next weekend, on March 16, a 15-year-old was shot in the shoulder near the intersection of Pratt Boulevard and Clark Street, he said. He reportedly took a cab to the Evanston Hospital "because the last time he was shot, he didn't like how he was treated" at the closer St. Francis Hospital, also in Evanston, Roussell said. Most recently, on Saturday, March 23, two victims thought to be from the Englewood neighborhood were shot as they left a party north of Howard Street on Jonquil Terrace. "A girl had recently moved into the neighborhood and had hosted a party with friends from the old neighborhood," Roussell said at a Thursday community CAPS meeting. "When they were leaving the party at 3:30 in the morning, walking to their parked car, a black, four-door vehicle pulled up" and fired eight rounds. The bullets struck one victim five times and the other once, he said. Because the victims were from outside of the neighborhood, Roussell said he thinks it was a case of mistaken identity. "They were looking for somebody else," he said. All of the shootings involved people with ties to gangs, he said, and the investigations have been hampered by the city's notorious "no-snitch code." "To crack the code of silence — the code of the street" is not easy, Roussell told residents Thursday. Gangs prefer "street justice" to cooperating with police, he said. He assured them the district officers are "very vigilant and concerned." He chalked up much of the gang violence as stemming from a rivalry between two factions of the Gangster Disciples, the Lawless Outlaw Crazy and the Cutthroat Gangstas. The factions have been at war since the 2008 stabbing of 16-year-old Isiah Stroud near the Jarvis "L" station, Roussell said. "This conflict, we've been dealing with it since '08," he said. "And these grievances are going to go on for quite some time."